Mix the flour, sugar, yeast and salt in a mixer. Add, while mixing, the butter milk, whole egg, yolk and soft butter. Keep the egg white for finishing. Knead the dough until elastic and smooth and make one large ball, put into a large bowl and cover with a moist kitchen cloth. Let it rise for 1.5 hour. Divide the dough into small balls of approx. 90 grams and let it rise for 30 - 40 minutes. Brush the egg white on top of the small balls and sprinkle with some sesame and poppy seed. Bake in the oven for 15 minutes on 185C. Cut the salmon in small cubes and mix with crushed rose pepper and finely chopped chives. Season with salt and pepper. Transfer into a round mould to make a firm burger patty of approx. 120 g.
Mix Hellmann’s Real Mayonnaise with the finely chopped fresh herbs, cornichons, onion and capers. Season with mustard, salt and pepper. Slice the burger bun open and grill cut side down on a skillet. Put the burger together with the samphire salad and pan roasted salmon burger. 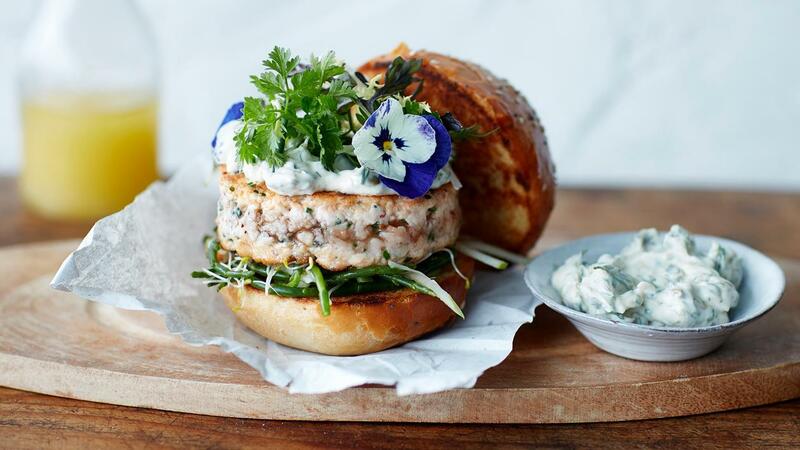 Finish the burger with the remoulade sauce, green herbs and edible flowers.